Moni (my mom) had a pretty limited repertoire in the kitchen but once in a way she would stir up something we weren't so familiar with. It is a fact that neither I nor my brother were great fans of vegetables and as a single mother she took the easier way out and cooked meats or fish just so we'd eat with a little less fuss. But as I grew up, and more so after I got married and developed an interest in food I started asking her how this vegetable or that was cooked - and with that began a journey of discovery for me of the myriad vegetarian delights of Bengali cuisine. Moni and I agreed that cooking non vegetarian food was always easier - there was less chopping and prep involved. But there was a wonderland of food in the vegetarian component of Bengali cuisine and once I showed an interest she would cook more vegetarian things as she finally had a less fussy audience. The fact that the brother (starved of vegetarian food in Dubai, thanks to his own limited repertoire in the kitchen) was also now willing to eat his vegetables certainly helped! 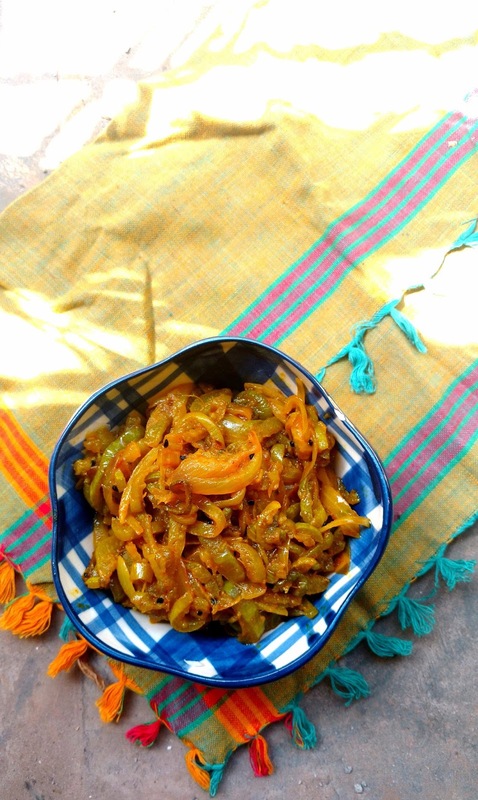 One of the dishes she made quite frequently was chichinge peyanj bhaja or snake gourd stir fried with onions. This preparation is as simple as a dish can get and yet is as delicious as ever. As I learned more vegetable recipes I realised how frugal the ingredients would be and how minimal the spicing. Most everyday vegetable recipes in Bengali cuisine let the vegetable and its own flavours shine, as you will see in this simple preparation of Chichinge Peyanj Bhaja. Cut the snake gourd into manageable pieces and scrape the surface to get rid of the white outer skin. A peeler will dig into the flesh of the gourd and you will end up wasting a lot. A good scrape with a sharp knife works just fine. 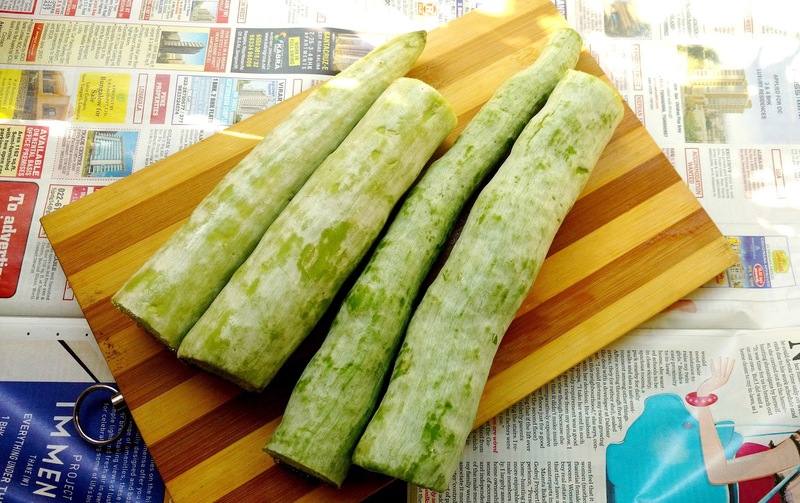 Cut the gourd in half length-wise and scrape out the pith and seeds with a teaspoon. Now slice the gourd as finely as you can - a couple of milimetres thin is perfect. Slice the onions equally fine. You should have gourd and onions to the proportion of 3:2. The gourd reduces as it cooks so having equal quantities will unbalance the dish. Heat mustard oil in a kadai/wok and once the oil is hot chuck in the kalonji and let it sizzle. Add the sliced gourd and fry on medium heat for a while. Once the gourd has started to soften add the onions, salt, turmeric and chilli powders and mix everything well. Add the sugar too at this stage. Now all you have to do is be patient and fry till everything is cooked. Cover the wok with a loose lid and let it cook for a few minutes, coming back to stir once in a way. Once the snake gourd is cooked through let any moisture dry off and let the onions caramelise just a bit. Serve with plain hot rice and a simple daal. It makes for a lovely light summer lunch. 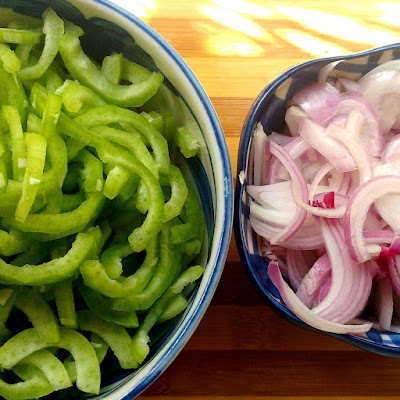 This recipe, like many traditional Bengali recipes is also vegan.